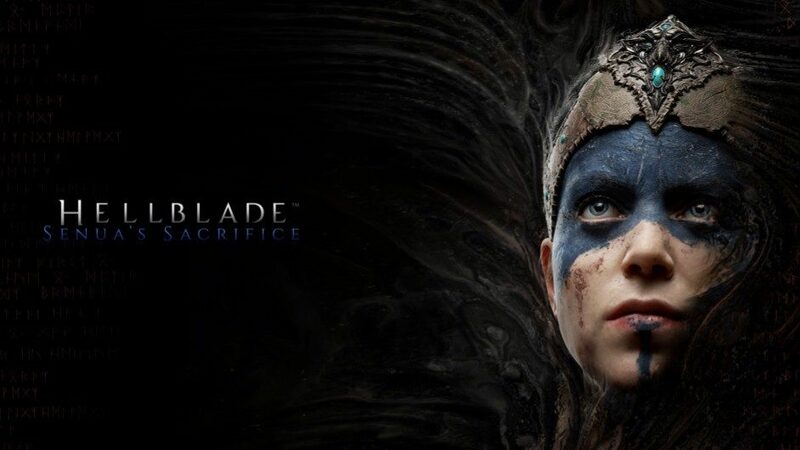 Hellblade: Senua's Sacrifice for PlayStation 4 and PC presents the stunning tale of one woman's struggle to grasp reality and save her lost love from death. You are stranded in darkness. The light that you believed would guide you has gone out and you have nothing to trust but yourself… except you don’t trust yourself, especially in the dark. You slide against walls, reaching for the next turn, and eventually find a large, open room. You must cross this room to escape the darkness. You know this because there is nowhere else to go. You walk forward, and there’s a sound not your own: a harsh, bestial sound. It haunts the room as you try to cross and grows louder. The cry invades your mind even as you try to avoid it. If you let it, the sound will find you and will never let you go. 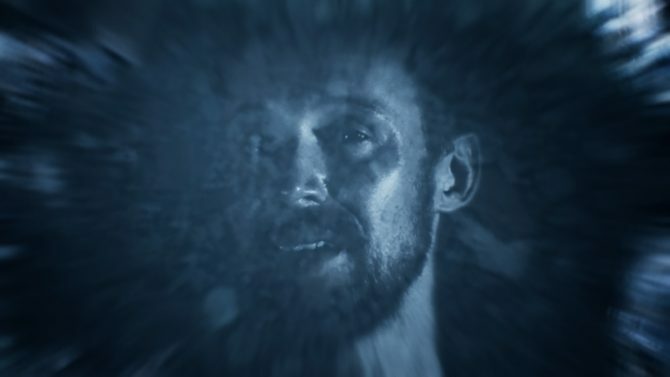 You proceed, horrified, not because you fear some beast, but because the horrors are in your mind, and if you stop they will trap you there forever, in the darkness. Hellblade: Senua’s Sacrifice tells the tale of the titular character Senua as she progresses through a nightmarish land steeped in Norse lore. As the last of her tribe of Celtic warriors, Senua embarks on a journey to release the soul of her lost lover Dillian, whom she believes to be held captive by the Norse goddess Hela in the depths of the underworld. However, as her journey unfolds and the player comes to know Senua better, it becomes clear that her mission is twofold. Although her ultimate resolve is for the salvation of Dillian, Senua also seeks redemption from the cruelties that have been wrought on her people, for which she believes she is the catalyst. The aforementioned darkness is a theme that is frequently used throughout Hellblade. It accounts for a variety of the evils that populate Senua’s world, but all of that stems from one place: her mind. The game’s events are fantastical. It is about gods and demons and ancient swords capable of slaying both. It is about a curse. It is also about one woman’s reality as seen through her severe psychosis. It’s a complex story only in that everything the player experiences is through Senua; as her perception of reality shifts, indeed so does reality itself. When Senua comes to a new revelation, the tone and the imagery of a scene can drastically transform. It’s an incredible narrative tool that regularly pulled me into the experience and made me feel something different than what I would expect from any other hack and slash action title. It’s somewhat difficult to pinpoint exactly what kind of game Hellblade is. Is it an adventure game, a narrative-driven game, an action game, a horror game? 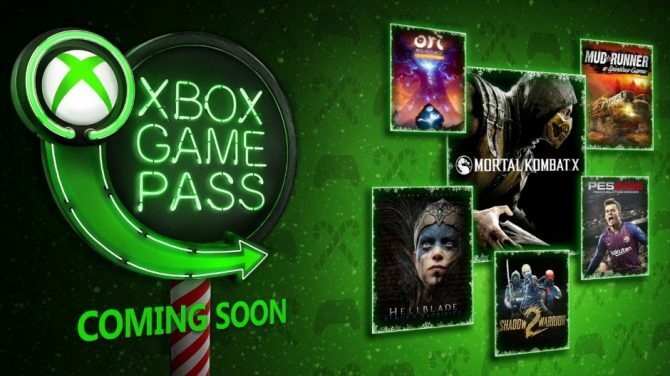 The truth is that Hellblade falls under all of these genres depending on the circumstance. You may be looking for obscure symbols within the environment at one moment, then battling Norse demons amongst encroaching flames, then listening to a mythological story while walking along a shipwrecked coast. 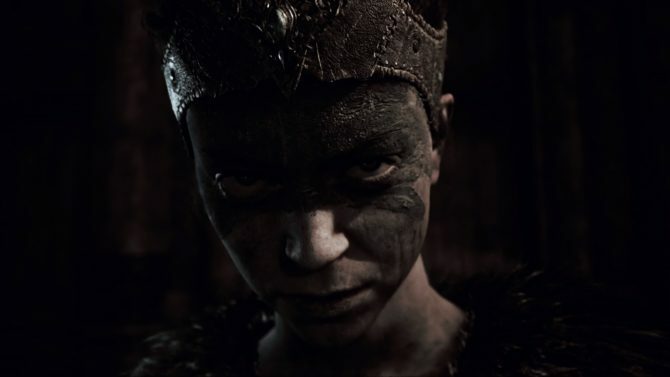 The gameplay varies widely from action, to walking-simulator, but Hellblade constantly finds unique ways of continuing the game’s momentum even in the complete absence of combat. With that said, Hellblade does have a fair amount of combat (it is called Hellblade). Senua will regularly come upon open areas that almost beg you to notice a battle is on its way. When this happens, she will automatically draw her sword — waves of enemies will materialize out of the air to fling themselves at her. To succeed each battle, Senua must lock-onto a single enemy and use a combination of quick/strong attacks to break their defenses and kill them. Of course, while engaging one enemy, another will try to flank Senua, requiring the player to weigh whether to dodge, block, or continue to button-mash a target into submission. A number of different enemy types are unlocked over the course of the game, keeping combat feeling fresh and challenging. There are also four boss battles that offer their own unique movesets and challenges. The game’s combat difficulty defaults to an “auto” setting that adjusts depending on how well the player performs. If you are particularly bad at combat, then the game will become easier. The better you are, the harder it will get. While you can easily adjust the game’s difficulty at any time, I found the “auto” setting to be most appropriate, especially given the alleged permadeath mechanic. 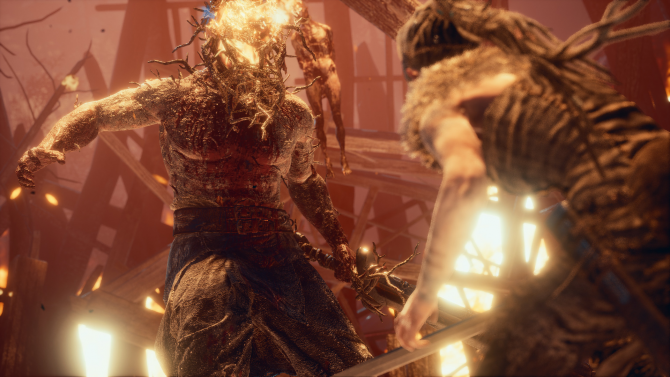 Hellblade’s permadeath mechanic is something that has been a particularly popular topic of discussion since the game’s release. Towards the beginning of Hellblade, a message appears that indicates the game will end in the event that Senua dies too many times. Not only that, but all progress will be lost. Frankly, it’s an odd message to see in the context of a game that offers no HUD, no visual input prompts, and no written tutorials, even during the first combat phase. Never throughout the rest of the game is Ninja Theory more heavy-handed than with this message, which makes it unsettling from the onset. There are some that argue the message is a red-herring, only there to make the player feel a heightened sense of tension. For my playthrough, I was never forced to test the authenticity of the game’s claim. Regardless, its intent was clear and intensely felt. 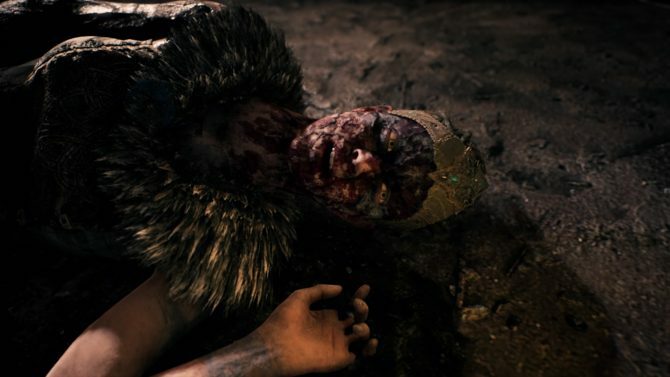 The progress towards any potential ‘Game Over’ is tracked as black tendrils that run up Senua’s right arm. 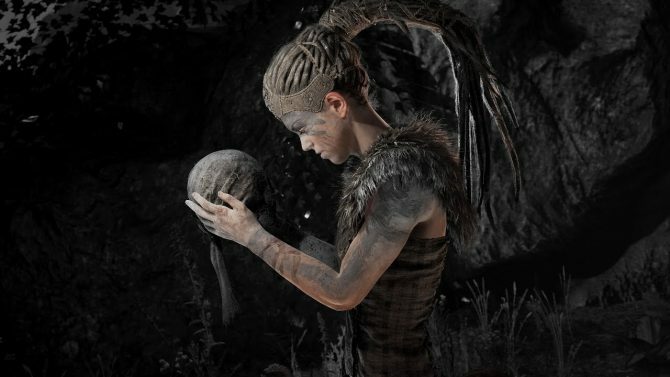 Only once these tendrils reach Senua’s head could the player be met with a permanently ended playthrough. 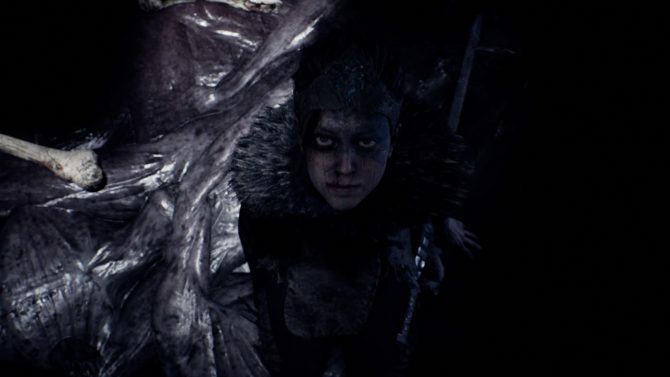 If Senua dies, a short scene plays (in most cases), showing her awaken to the movement of these black tendrils, creeping closer to their destination. It’s a worrisome sight, not only for its implications to Senua’s survival but also because each death may mean the last for the entire playthrough. This mechanic adds a level of inherent risk for players. Although I didn’t need a permadeath system to sympathize with Senua, it grounded my actions with real consequences, whether they actually exist or not. All that mattered was that they were real to me. 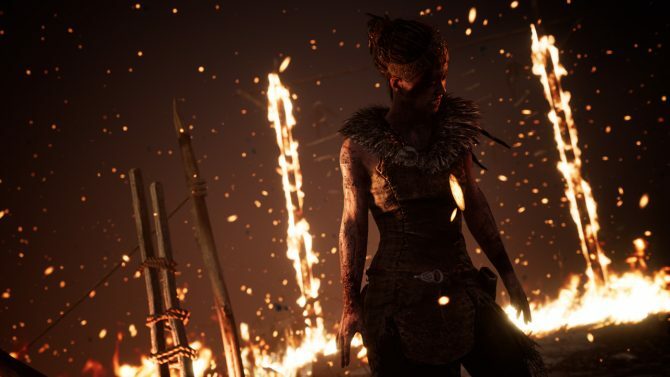 Like Senua, I was forced to accept that this journey could end in darkness simply because I believed so. This would not be the last element Ninja Theory employed to empathically bind player and character. Arguably one of the most arresting aspects of Hellblade is its sound. Before the game starts, a message from Ninja Theory encourages players to experience the game wearing headphones. I strongly suggest that you heed this advice! The game’s sounds are subtle, including its dialogue, which can sometimes be lost in the music and sound effects when listening through monitor speakers. While listening through a PlayStation Gold Wireless Headset, I had absolutely no trouble with this. In fact, I found that listening through headphones made certain sounds apparent when I had no idea they existed before putting them on. Part of real-world psychosis can involve hearing the voices of people who aren’t there. 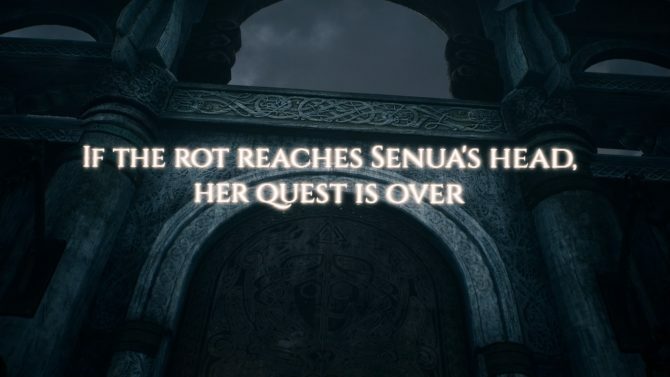 Like many, Senua hears voices of her own, some representing her hesitations, her doubts, her fears; some others are there simply to mock her or to convince her that this quest is folly. Through any open speaker system, these voices seem to be mere echoes. Through headphones, they are a complete binaural experience. It was a mechanic that I found to be pervasive in my playthrough of Hellblade: Senua’s Sacrifice. It was disturbing, humbling, even frightening at times. It is the primary reason why I believe Hellblade should be considered a horror title and one not to be tread lightly by those who experience, or know someone who has experienced, psychosis. To its credit, Ninja Theory makes this warning before ever reaching the game’s splash screen. Ninja Theory went through lengths to fully understand and realize what it’s like to live with psychosis, consulting professionals who study mental illness and even those who regularly live with it. If you want, you can see the extent of these efforts in a short feature included in each copy of Hellblade. It’s clear to me that this research did not go to waste. 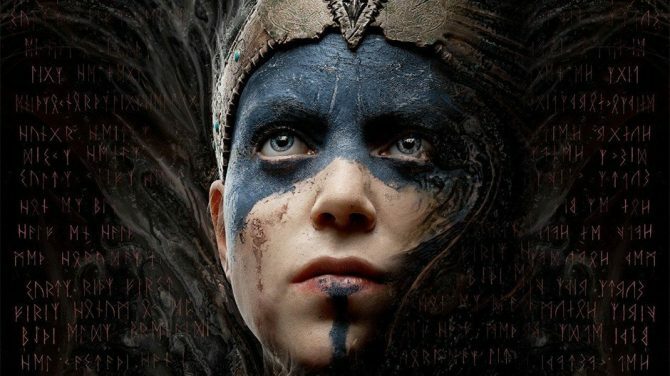 Without the authenticity of Senua’s experience, Hellblade would be an ordinary and ultimately short-sighted window into mental illness that does little more than aggravate the stigma already surrounding those who suffer from it. Instead, it’s an enlightening, albeit harrowing, experience that empathizes as much as it informs. Although I can’t say enough about the game’s sound design, Hellblade’s visual presentation is nothing short of a marvel. Whether walking through expertly crafted environments or impaling a beast with a blade, the game regularly impressed me by using a wide range of color, detail, and pure style. What at one moment might be a verdant glen can instantly shift to shadow as Senua’s nightmares creep into reality. Although the environment’s physical features remain the same, they take on an entirely new tone to match Senua’s mindset, whether it be at peace or enraged. However, what may be Hellblade’s greatest technical achievement is its use of jaw-dropping facial capture. 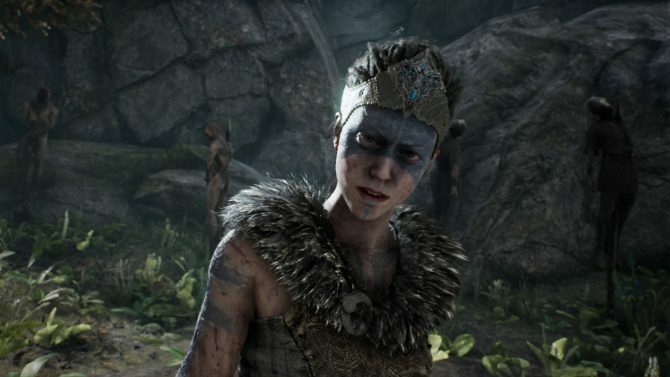 There were points in the game’s cutscenes where I legitimately did not know if I was looking at a digital representation of Senua or Melina Juergens, the actress who plays Senua. She can look that real, and this is coming from someone who regularly rolls his eyes at the use of such mechanics in today’s films. 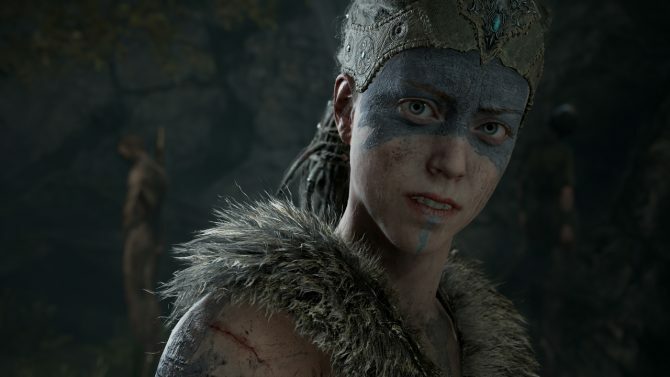 To be clear, Senua is the only character in the game that is digitally rendered. There are a few other characters who are represented by live-action performances, but none of them appear within the environment, so there’s no live-action Dillian shaking Senua’s digital hand. They are only made to appear as part of Senua’s psychosis or as relived memories. At first, I found it distracting that these performances were not also digitally rendered. However, I later came to accept it and then completely forgot that I cared in the first place. Ninja Theory claims to have made this decision to drive down the game’s overall budget. In light of the game’s $30 price tag (rather than what could have been $60), I think it was a cut-corner that paid off. As far as Hellblade’s performance is concerned, it was nearly flawless. For most of my experience, I didn’t notice anything amiss. However, there were a couple of circumstances that stood out as problematic. First and foremost, about halfway through Hellblade, I ran into a bug that rendered my playthrough unplayable. After briefly closing the application and later reloading my save file, the environment had become completely absent of light save for a few torches. It was so dark that I was unable to navigate out of the area and was forced to start a new game. For a title that takes about 8 hours to complete, this was hardly Ragnarok (that’s a Norse apocalypse reference for you). However, it was a disappointing setback and one that could be frustrating enough to cause some players to quit the game indefinitely. The other issue I encountered was during use of Hellblade’s Photo Mode. For a game this visually impressive, I was glad to find that Ninja Theory decided to incorporate this feature. While tinkering with it, I toggled the options menu ‘off,’ snapped a few screenshots, and tried to exit the mode only to find that I couldn’t. No apparent combination of prompts would bring the options menu back or allow me to continue playing the game. Eventually, I decided to close the application and reload to the most recent checkpoint, which allowed me to progress with ease. The technical issues presented here range from game-breaking to minor inconvenience, but in comparison to what the rest of the game does right, I find it difficult to find much fault in the overall experience. Certainly, we can call bugs such as these avoidable and point the finger at Ninja Theory for releasing Hellblade in an imperfect state. However, in my experience, I did not encounter any further performance issues that suggested these bugs were anything except outliers. Hellblade: Senua’s Sacrifice is a finely made game. Despite a bug that forced my first playthrough to end prematurely, Hellblade: Senua’s Sacrifice is an incredible game that will continue to linger with me as a singular and emotionally affecting experience. For its audio and visual design alone, it is stunning, but for its ability to use the video game medium to bridge our understanding of mental illness while also telling a personal and powerful story, it is a masterpiece. If you feel capable of withstanding the emotional strain it requires, a dark and fulfilling tale awaits.